This latest direct-to-home release from DisneyToon studios takes us back to Pixie Hollow for the first time since Tinkerbell learned of her sister, Periwinkle, in 2012’s “Secret of the Wings”. 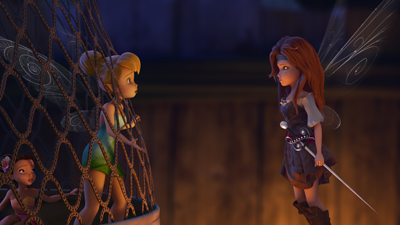 In “The Pirate Fairy”, Tinkerbell (Mae Whitman of “Secret of the Wings” and “The Perks of Being a Wallflower”) is relegated to the ensemble, while a new fairy takes center stage – the adventurous, inquisitive Zarina (Christina Hendricks of “Mad Men”). Zarina is a dustkeeper fairy, entrusted with the production and safekeeping of the pixie dust the fairies use to fly. We meet Zarina on her way to work at the depot that serves as the dust factory, and she seems distinguished from her fellow Pixie Hollow residents primarily in that she walks rather than flying. There’s teasing along the way about how she’s used up all of her dust (again), suggesting that perhaps she spends a little too much time playing around. As it turns out, she’s using the pixie dust for experiments she’s been conducting – trying to understand the magical properties of pixie dust. Her fellow pixies are more interested in that the pixie dust works and have no desire to understand how or why it works, but Zarina persists, even pestering her foreman, Fairy Gary, while helping him transfer the precious blue dust that serves as a multiplier for the gold dust. Just one speck of blue dust in the gold dust produces prodigious quantities of the latter, as Gary explains. Zarina is later found in her home, experimenting with chips of blue dust, flower petals, and gold dust. 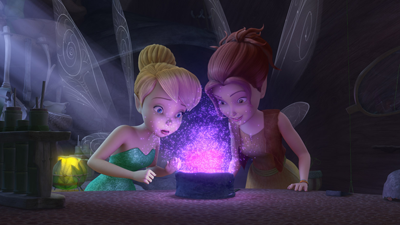 Tinkerbell finds her and lends a helping hand, enabling Zarina to concoct multiple colors of dust in short order. While both pixies are fascinated with the results of the experiments, Zarina’s enthusiasm leads to an unfortunate industrial accident that causes a vine to grow out of control – wreaking havoc everywhere, including the Dust Depot. Fairy Gary strips Zarina of her dustkeeper duties, and she runs away from Pixie Hollow in her despair. A year later, all of the pixies gather for an annual spectacle that brings together all four seasons’ worth of their clans, and the prodigal pixie returns under the cover of night. She uses some of her homemade dust to grow poppies that emit a powerful sleep pollen; all but Tinkerbell and a small chosen few of her friends remain unscathed and awake. With the majority of the other pixies out cold, Zarina pilfers the entire supply of blue dust and heads for the coast. Tinkerbell and her friends race after her, but Zarina scatters a series of dust colors on them – switching their talents – and heads to a pirate ship under her command. Tinkerbell and her friends, including Silvermist (Lucy Liu of “Elementary” and the “Charlie’s Angels” movies), have to learn how to control their new talents and sneak onto the pirate ship, where they find the spunky Zarina and her shipmates, including her cabin boy, James (Tom Hiddleston of the “Thor” movies and the forthcoming “Only Lovers Left Alive”). Zarina and James hatched the scheme to get the blue pixie dust so they could produce more gold pixie dust from the tree grown by one of Zarina’s special dust batches. The pirates hope to use their private pixie dust supply to make their ship fly through the air, committing acts of pillage and thievery world-wide with their untouchable “flying frigate”. Suffice to say that the twists and turns in this plot are telegraphed nicely, and while kids may miss out on the origin story that emerges – keen-eyed adults will spot it and be pleasantly amused. There’s even a subtle reference to “Star Trek: The Next Generation”, for those keeping an ear open during a scene on the pirate ship. 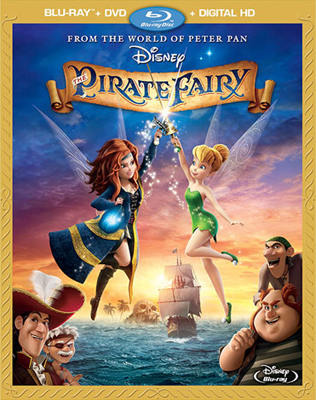 Clocking in at just over 70 minutes of actual movie (and don’t skip the first half of the credits, lest you miss the final BLINKING ARROW that points to exactly whose origin story is being told), “The Pirate Fairy” is a cute, family-friendly visit to Pixie Hollow that shows the value of friendship, persistence, and the scientific method. Hiddleston has a really great singing voice, so chalk one more point up for the young, talented Brit. One can only hope that he’ll continue to participate in future adventures, since James has many more stories yet to be written. 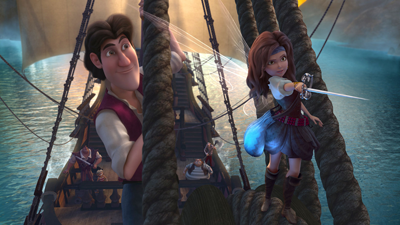 “The Pirate Fairy” is available for sale on DVD and in a Blu-Ray/DVD/Digital combo pack starting April 1, 2014. This movie is rated G for general audiences. This entry was posted in movie reviews and tagged captain hook, captain james hook, disney, movie review, neverland, peter pan, pixie dust, the pirate fairy, tinkerbell, zarina by crunchymetromom. Bookmark the permalink.